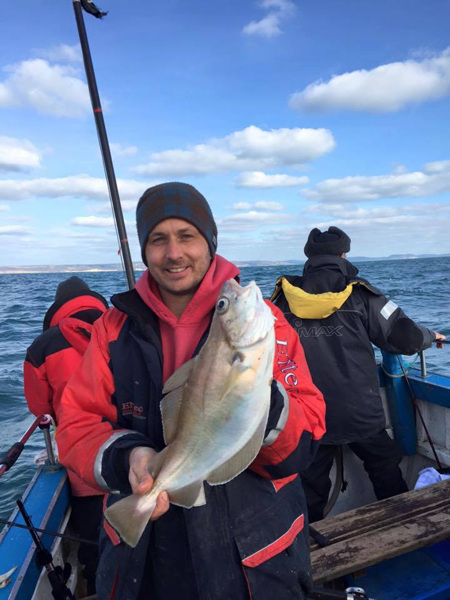 PhD student Adam Rees from Plymouth University Marine Institute, who is working on the Lyme Bay Reserve Scientific Potting Study, was invited to write a blog for the Society of Conservation Biology about his relationship with Lyme Bay Reserve fishermen among other things. 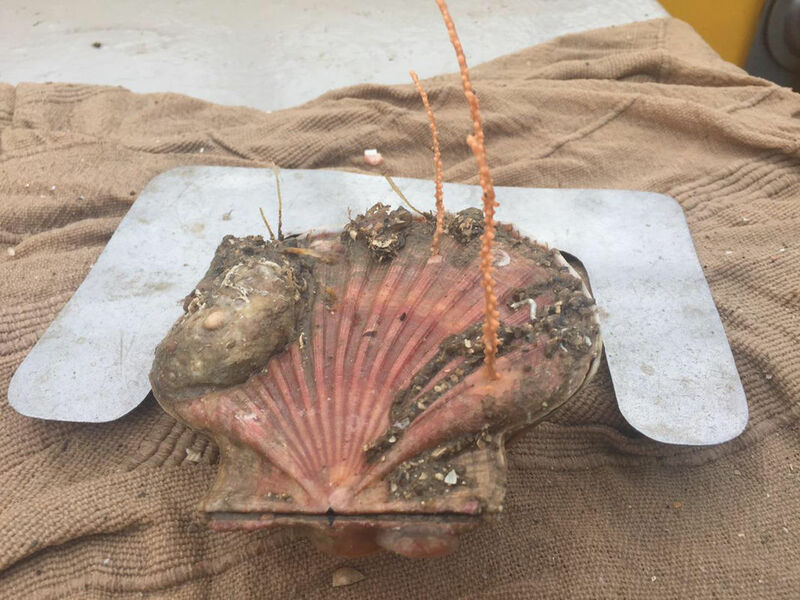 Scallop diver John Worswick from West Bay has shared this picture of a King Scallop with two baby Sea Fans growing on it. 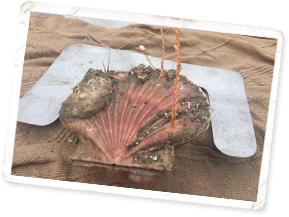 Proof that the seabed of Lyme Bay is flourishing once again. Flora and fauna is just as diverse as the commercially caught species and include Sea Squirts, Sea Fans, Starfish both Common and Spiny, Dead-men's Fingers, Ross Coral, Yellow Hedgehog Sponge, Cup Corals and Sea Slugs; don't be fooled by the name, these are some of the most beautiful creatures in the sea! 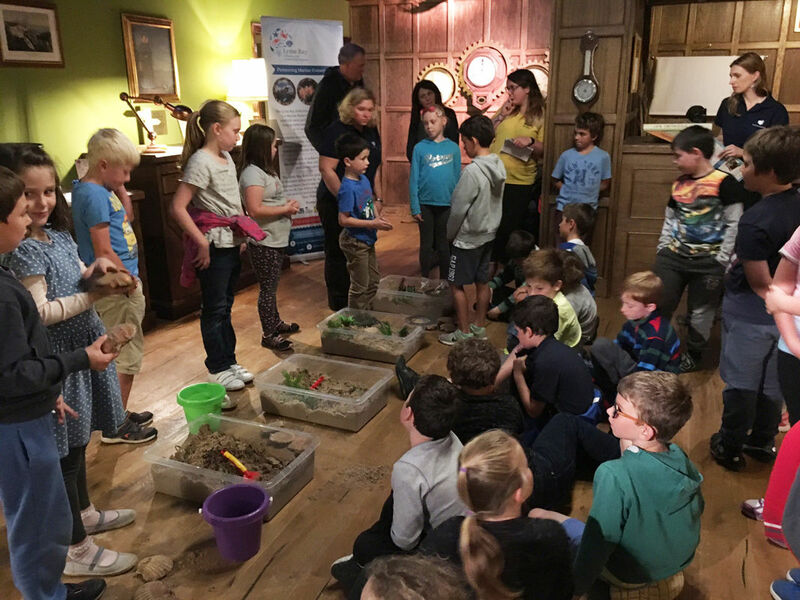 A busy day was had at Seaton Jurassic on Wednesday as we hosted a Schools Outreach visit. 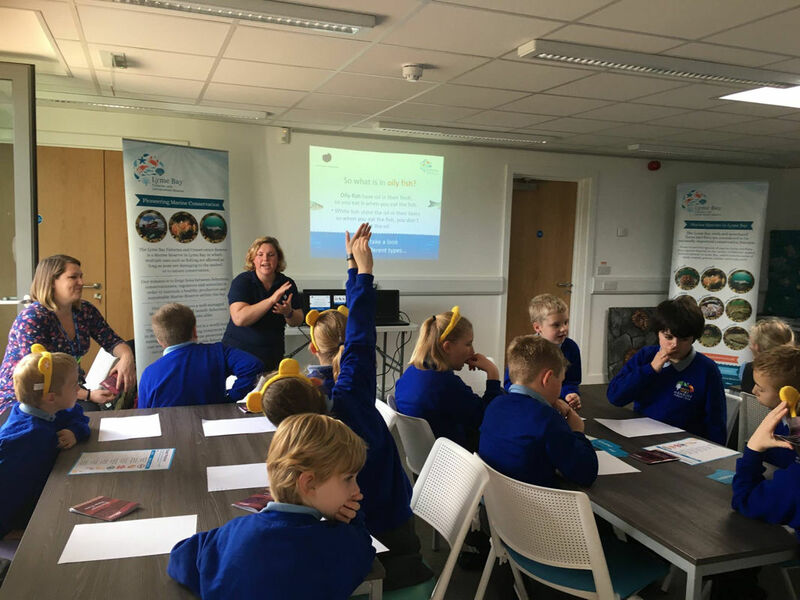 Membury County Primary School from Axminster came to the Centre for an action packed morning which started with a visit of the Centre and the Lyme Bay harbour set outside, which includes a sustainable fishing game. This was then followed up by a session on Food Miles & Nutrition (with fishy links of course!) 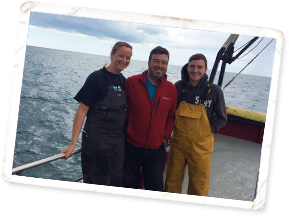 hosted by Mari, the Lyme Bay Fisheries and Conservation Reserve Education Officer. 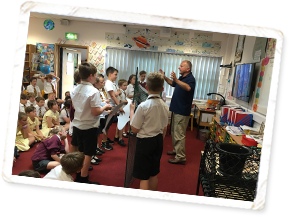 It wasn’t just Membury Primary School who enjoyed a Schools Outreach visit on Wednesday – Marshwood CofE Primary School were visited by Education Officer Neville Copperthwaite as part of the Schools Outreach Programme… it was certainly all systems go on Wednesday! 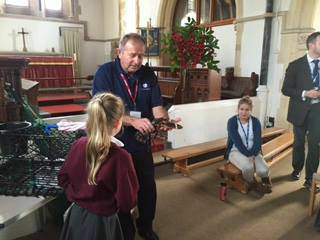 Marshwood Primary were taught about the different types of sustainable fishing methods found in Lyme Bay Reserve and the life-cycle of a lobster, including a live lobster to get up close with. The teaching methods are hands-on and engaging, much to the children’s enjoyment. 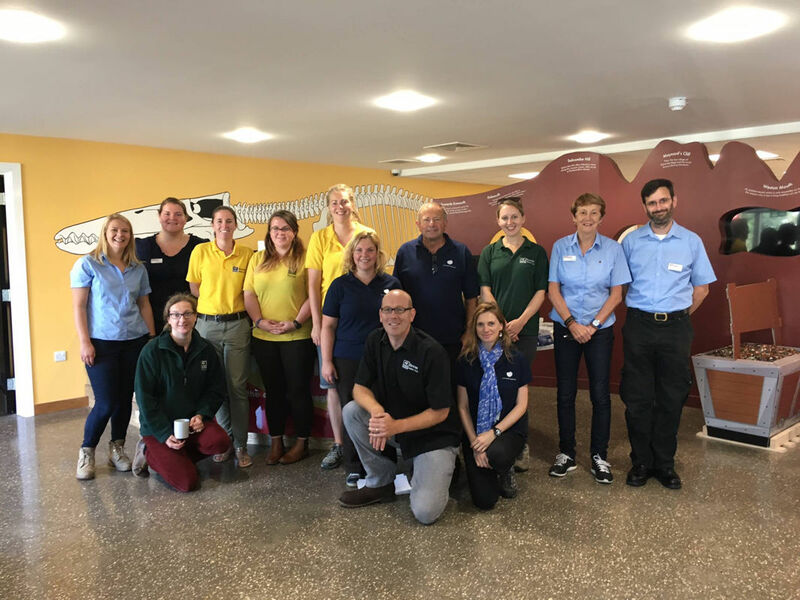 A fun-packed day was had at Seaton Jurassic last week as we attended the Devon Wildlife Trust Wildlife Champions Conference along with 200 school children from around the area. 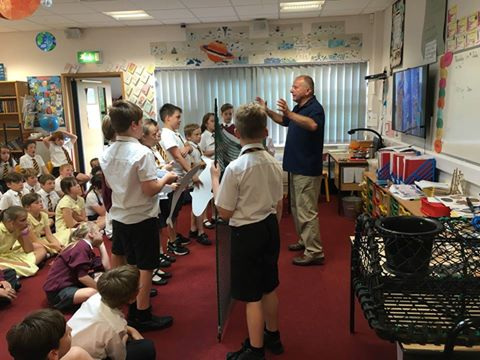 The aim of the day was to teach children about marine life and the challenges it faces and to become inspired to take action in their local community. We were invited to be part of this great day, so we conducted two hands-on activities to six groups of very enthusiastic school children throughout the day, where they learnt about the effects of sustainable and non-sustainable methods of fishing for scallops along with learning how different size fishing nets can catch different quantities of fish. 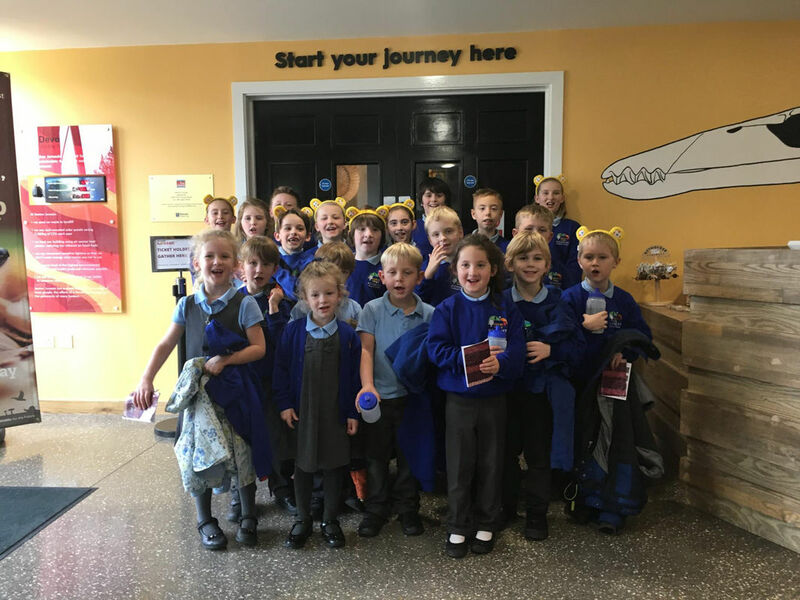 Each school went away with an extended learning pack for further learning back in the classroom – all part of the on going Schools Outreach Programme. The day started with each child drawing a picture of what they think the sea looks like in one colour – they were then asked to add to the drawing in a different colour at the end of the day to gauge how much they had taken on board. We think the drawing here speaks volumes! A fantastic day and one that will be followed up in six months time to discover how the school children have gone about taking action in their local community. Another successful Food Rocks Festival was held in Lyme Regis over the weekend and the Lyme Bay Fisheries and Conservation Reserve headed down to Chefs Demo Stage to watch the culinary delights being whipped up by Mark Hix and fellow Chefs such as seafood ambassador Mitch Tonks, Gill Mellor from River Cottage and James Golding from the The Pig Hotel. Sustainable seafood was a menu highlight over the weekend and www.directseafoods.co.uk in partnership with the Lyme Bay Fisheries and Conservation Reserve supplied the Chefs with an abundance of sustainably caught 'Reserve Seafood' straight out of Lyme Bay. The audience looked on (and sampled!) the delights the Chefs created and discovered more about origins and history of reserve Seafood. 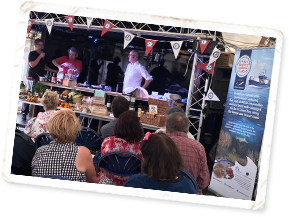 The Food Rocks Festival raises money for the RNLI, the Fishermen’s Mission and BLUE Marine Foundation (facilitators of the Lyme Bay Fisheries and Conservation Reserve) - three charities close to Mark Hix's heart. 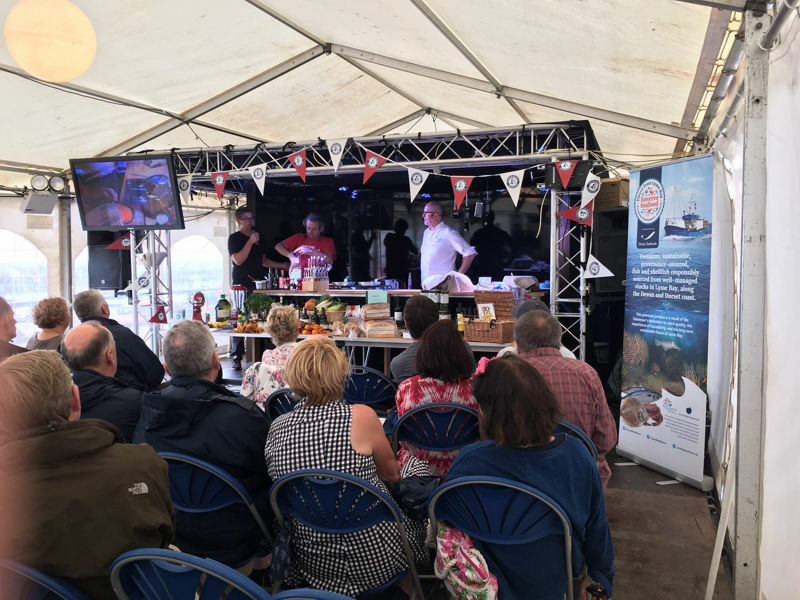 The Festival was a great success in terms of communicating to the hungry audience about the sustainably caught Reserve Seafood from Lyme Bay. 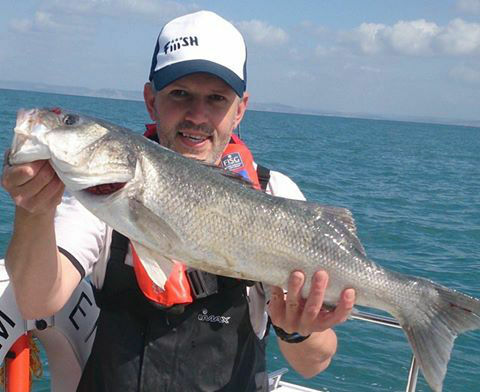 Beautiful rod & line Bass caught in Lyme Bay Reserve on board KT-Sam from Axmouth. 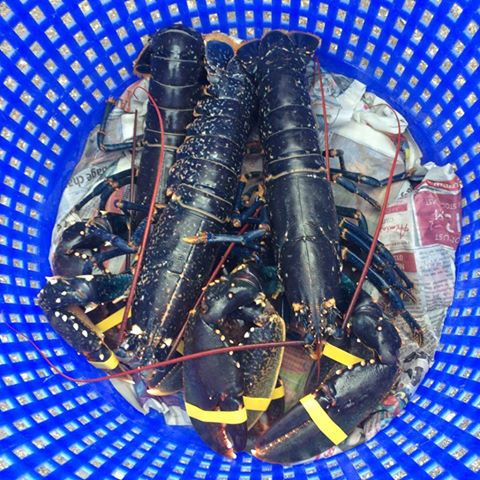 Sustainably caught and tasty, what’s not to love! Have you ever seen a starfish do this? Dr Emma Sheehan, Research Fellow from Plymouth University Marine Institute explains this unique behaviour: The behaviour "starballing" by common starfish (Asterias rubens) in the UK was documented by Sheehan & Cousens 2016 in Marine Biodiversity. It involves starfish being carried along by tidal currents. Starballing could explain the phenomenon of mass stranding and provides a speedy method of relocation. 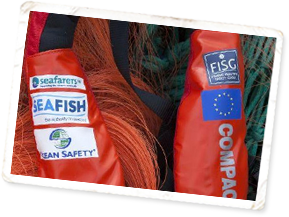 Tim Glover, Chairman of the Lyme Bay Fisheries and Conservation Reserve shares his views on the importance of fishermen wearing Personal Floatation Devices. 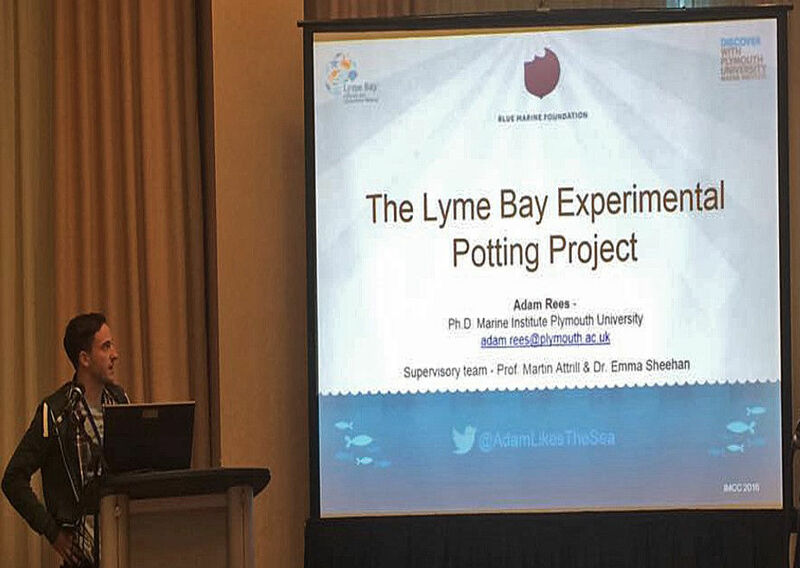 Adam Rees from the Plymouth University Marine Institute has been over in Canada this week at the International Marine Conservation Congress (https://imcc2016.wordpress.com/) talking about his PhD research on 'Potting impacts in a temperate MPA - Lyme Bay Reserve'. 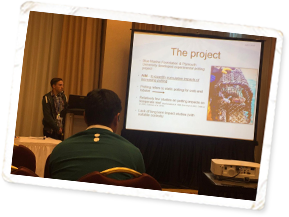 Talks also included Sarah Gall, marine ecologist and socio-economist on 'Can multi-use Marine Protected Areas address both fisheries and conservation goals?' and Emma Sheehan, Plymouth University Marine Institute research fellow on 'Resilience of MPAs to storm impacts'. Well done everyone, looks to have been a very successful trip, including spotting the amazing wildlife Canada has to offer. 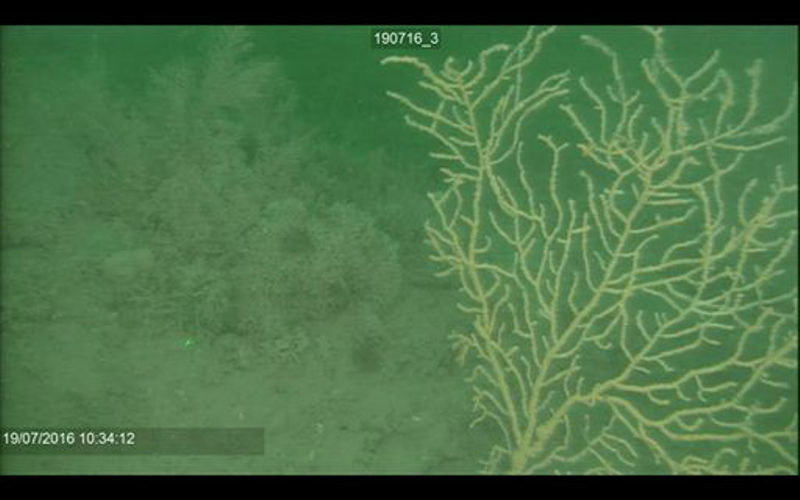 Some interesting screen grabs from the recent towed video work taken from inside the experimental potting areas in Lyme Bay Reserve shared by Adam Rees, PhD student working with the Plymouth Marine Institute on the Lyme Bay Potting Intensity Project. 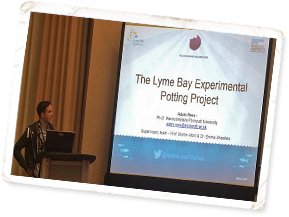 The aim of the experiment is to develop a sustainable potting management plan and a better understanding of appropriate effort levels and their effects on target species and seabed species. In the photos you can see a branching sponge, pink sea fan, Ross coral, white sea squirt and a unnatural fisherman’s glove! 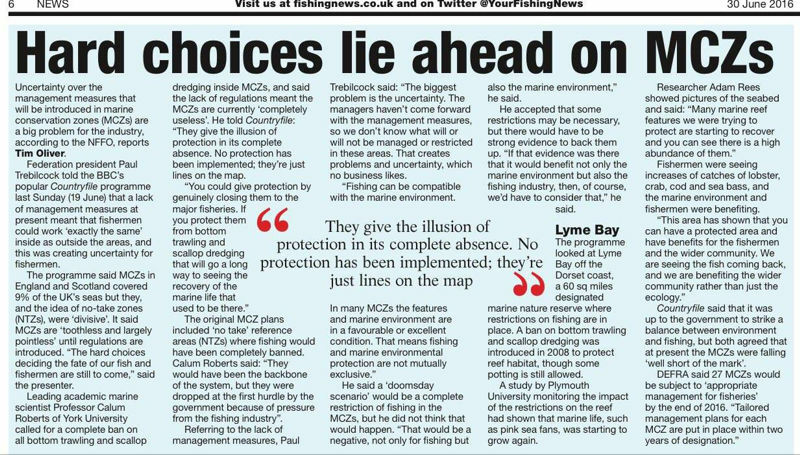 Write up in Your Fishing News following the BBC Countryfile piece on Marine Conservation Zones (MCZs) featuring Lyme Bay Reserve and our very own Adam Rees from Plymouth Marine Institute. 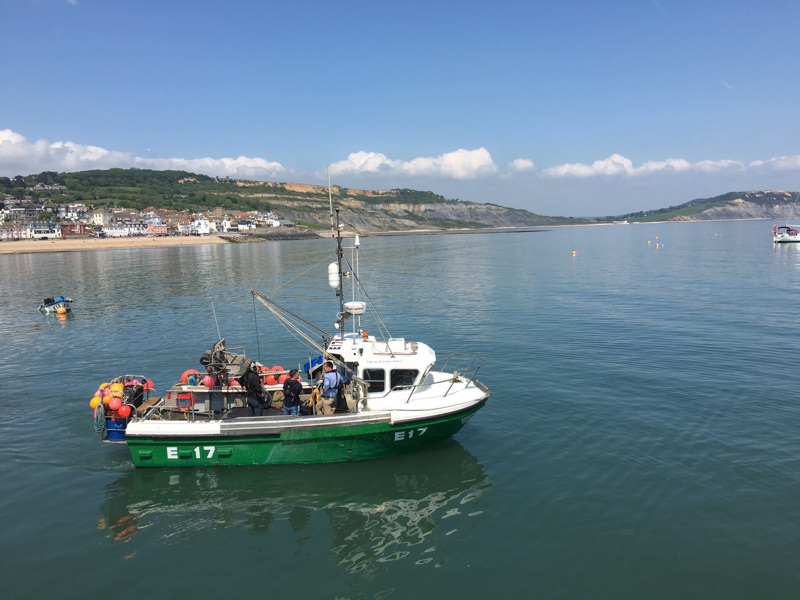 Calm seas greeted Dr Emma Sheehan, Dr Alun Morgan and PhD student Adam Rees from the Plymouth University Marine Institute with crewmembers on board Miss Pattie in Lyme Bay this week as they headed out for more underwater video sampling of the Lyme Bay seabed. 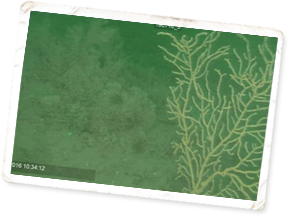 Filmed by Plymouth University Marine Institute and funded by DEFRA, the quantitative data obtained from the HD videos on the mobile organisms in each of the experimental potting areas forms part of the on-going investigation into the impacts of potting and to establish sustainable fishing levels and the effects on the seabed. 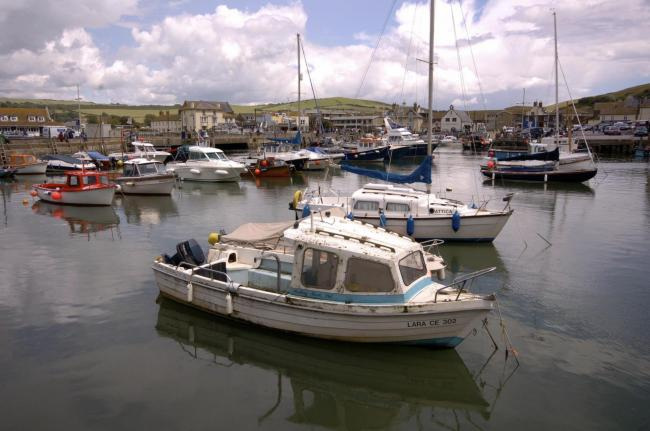 This data will then be used to underpin the management of Lyme Bay Reserve. 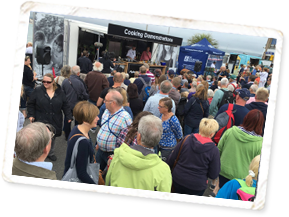 A bumper-packed weekend was had at the Dorset Seafood Festival in Weymouth, with over 50,000 people flocking to the historic harbour to watch the live cooking demonstrations from the region’s best loved chefs AND taste their dishes. And we certainly had our work cut out over the two days! 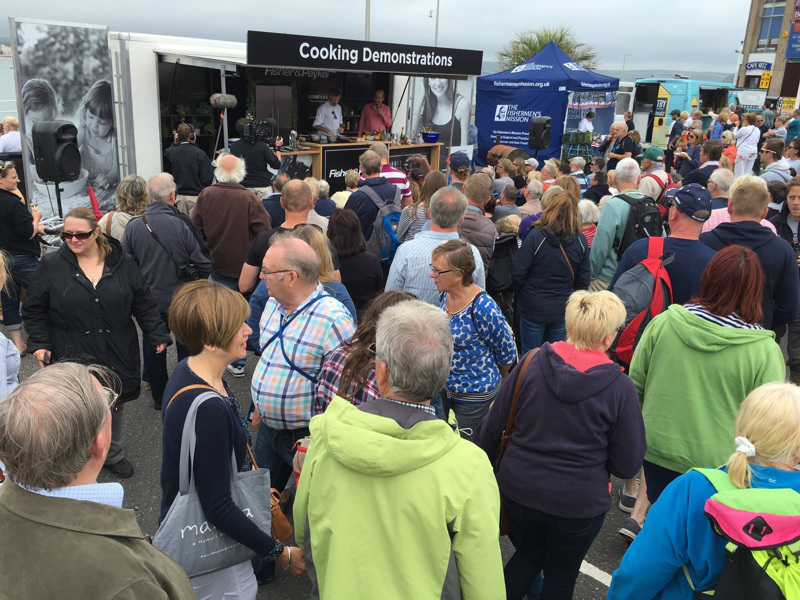 This year we were promoting Reserve Seafood, the premium, sustainable, provenance-assured fish and shellfish from Lyme Bay Reserve.The weekend started with interviews on BBC Radio Solent and BBC Radio Dorset, followed by filming with amigopartnership.com about ‘Local Food Heroes’.The demo stage got underway with Chefs demonstrating their skills and dishes. We had the great pleasure of Matt Budden from Hilton Bournemouth, Peter Gordon from the The Providores & Tapa Room Restaurant, Mat Folas from the Bramble Cafe & Deli and Russel Brown from creativeaboutcuisine.com all cooking with and promoting Reserve Seafood - their dishes looked delicious! 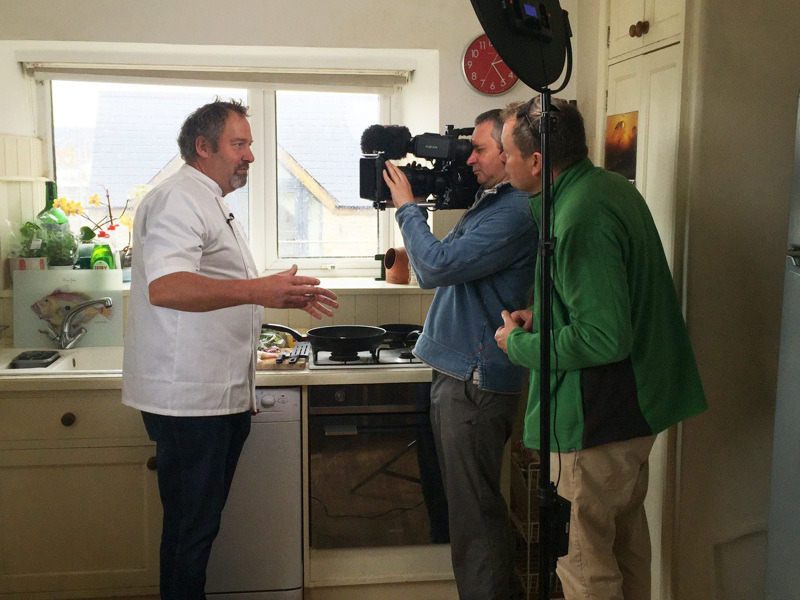 The weekend finished with an interview with ITV News West Country about our involvement with the Dorset Seafood Festival and the importance of sustainable, local seafood. With all that happening we did manage to sample some of the wonderful, local seafood delights that were on offer. Filmed by ITV Westcountry News. 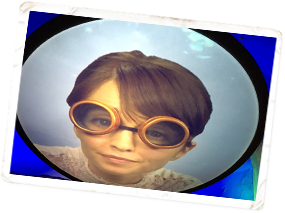 Copyright ITV 2016. 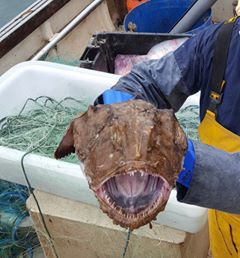 A nice surprise in the nets of KT-SAM E10 yesterday whilst out fishing in Lyme Bay, with Turbot & Monkfish making a splash and putting a smile on the fishermen's faces. 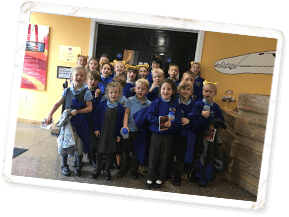 Schools Outreach Visit, Redstart Primary School in Chard. 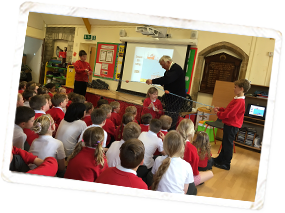 Another successful Schools Outreach visit happened last week, this time at Redstart Primary School in Chard. 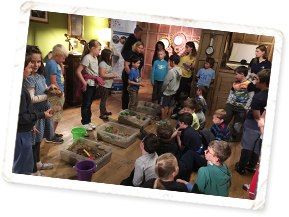 The Schools Outreach Programme aims to teach children about the many different species found in Lyme Bay and why it is important to conserve it. 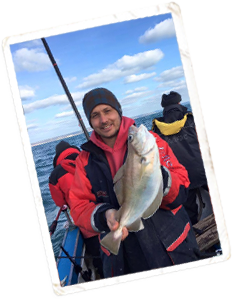 We also demonstrate the sustainable ways of fishing in the Bay and the importance of putting undersized fish back to grow bigger and to reproduce and the role the fishermen have in conserving the area. We also touched upon the subject matter of life-cycles, featuring a live lobster! The children had been learning about life-cycles and were able to apply their knowledge to the life of a lobster. It's summer term now, however the bookings for the next term in September are already coming in. 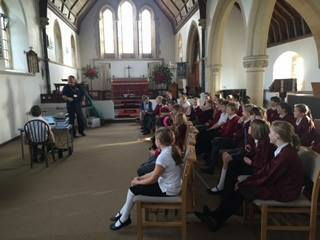 If you would like us to visit your school please contact out Schools Outreach Programme Officer on . 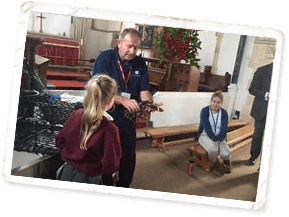 Last week saw another successful Schools Outreach Programme visit, this time to West Chinnock Church of England Primary School. 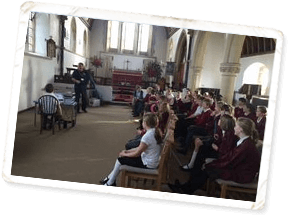 With two talks booked, one for Key Stage 1 pupils and one for KS2 pupils it was a busy afternoon. 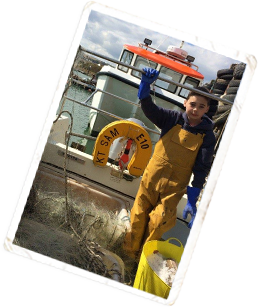 The children were given a unique insight into the workings of Lyme Bay Fisheries and Conservation Reserve, in particular how the different fishing practices used in Lyme Bay have an effect on fish stock and how the fishermen play an important role in making sure there are fish to catch for future generations. 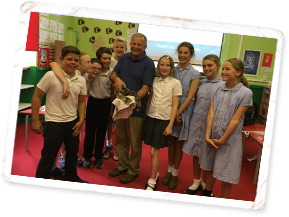 The children were also shown the many types of marine mammals and flora and fauna that live on the seabed. The highlight of the afternoon was the live lobster! 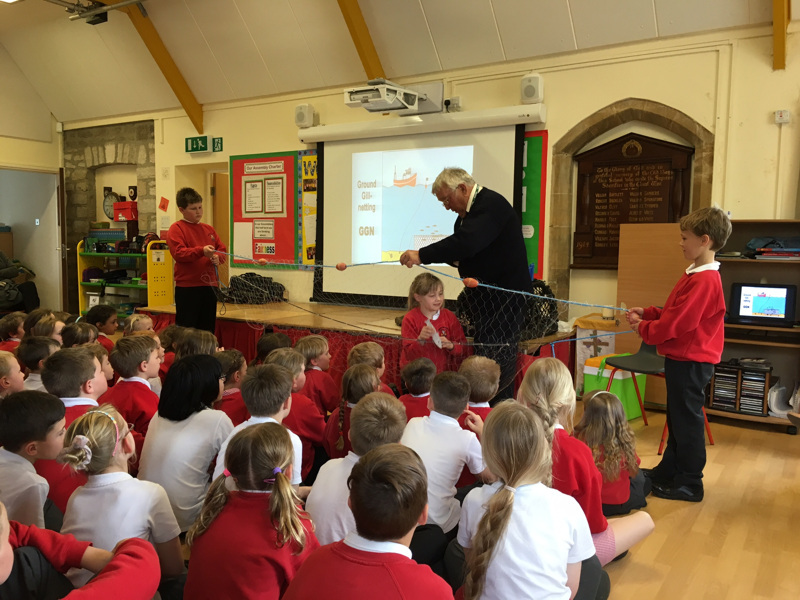 The children were fascinated about how it is caught and when it should go back in the sea if it is undersized. 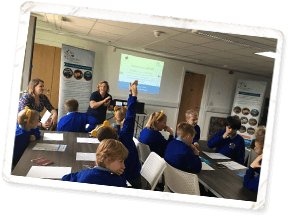 If you work in the education sector and would like to book a Schools Outreach visit, please contact the Programme Coordinator Nicky Mitchard on . Fish a' plenty this fine day! 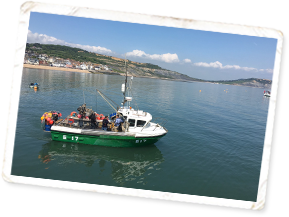 With this fine weather we're having the fishermen of Lyme Bay Fisheries and Conservation Reserve are busy catching some of the finest, sustainably sourced, premium quality, provenance-assured seafood from Lyme Bay. 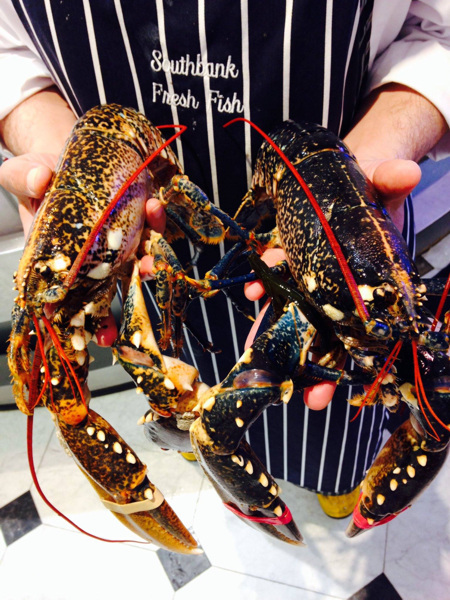 Like these fantastic live native lobsters, which are in store at Southbank Fish at Selfridges and the crew aboard KT-SAM E10 from Axmouth bringing ashore this tasty catch. 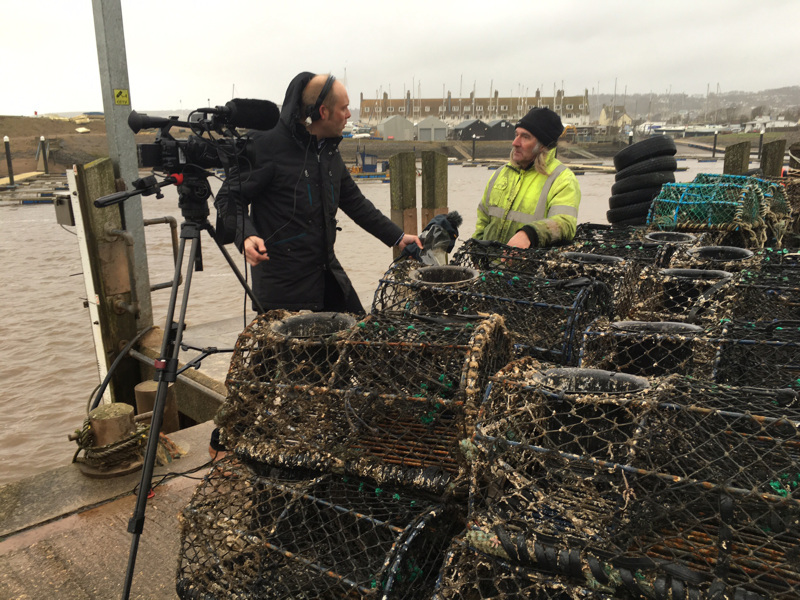 Sunny conditions for BBC Countryfile yesterday as they headed to Lyme Regis to film about the Lyme Bay Fisheries and Conservation Reserve - a shining example of how management can lead to an improvement in the marine environment. 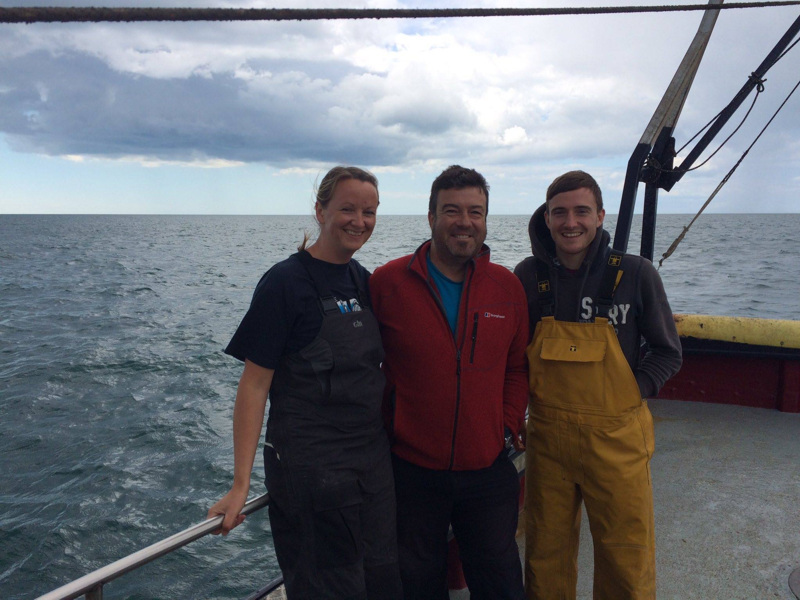 Onboard were BBC Countryfile presenter Tom Heaps, Adam Rees, PhD student from Plymouth University's Marine Institute who is conducting the Scientific Potting Study in Lyme Bay and scallop diver Jon Shucker. It's set to be an interesting feature, so stay tuned as we bring you the date and time of when it will be aired. 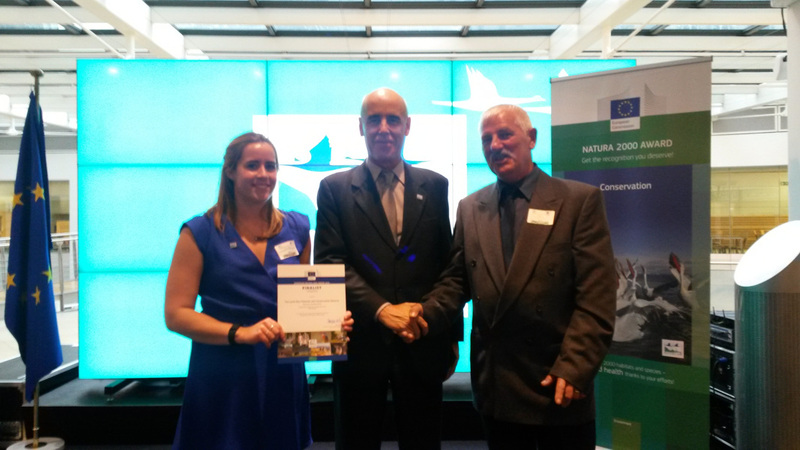 Unfortunately there were no wins at last night's EU Environment Natura2000 Awards, however pictured here is BLUE Marine Foundation's Project Officer Lauren Nelson with Lyme Bay Reserve fisherman Nigel Hill with the Finalist Certificate. 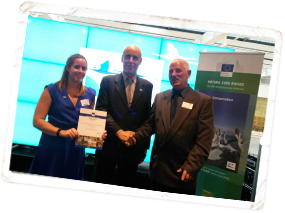 It is a fantastic achievement to be a finalist in an award that recognises the fantastic work of preserving natural heritage and one that recognises the efforts to conserve Europe's nature. 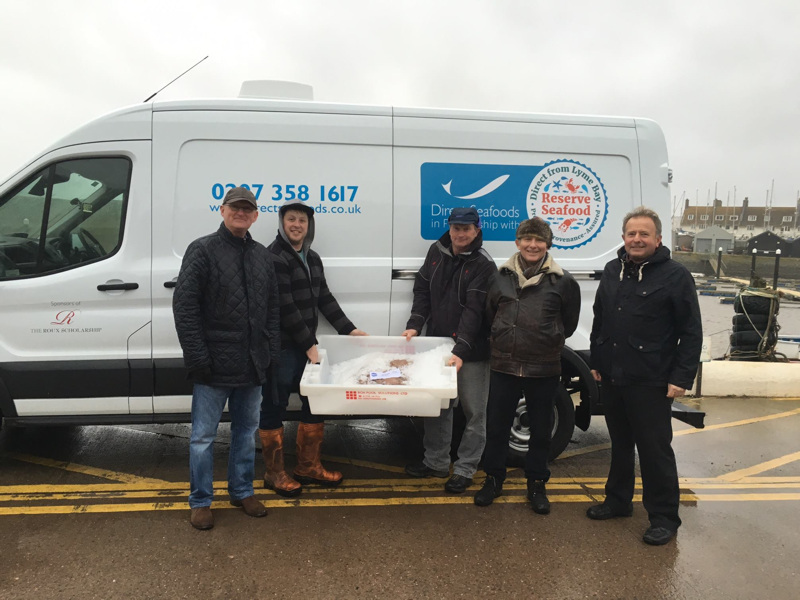 Well done BLUE Marine Foundation and the Lyme Bay Fisheries and Conservation Reserve! 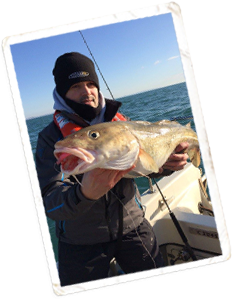 On Wednesday 11th May, local fisherman Steve Wainright took his boat 'Ollie' on a fishing trip. Nine miles out in Lyme Bay, in unusually calm waters, this happened! Steve said it was an amazing experience and they stayed around by his boat for about 10 mins or more. 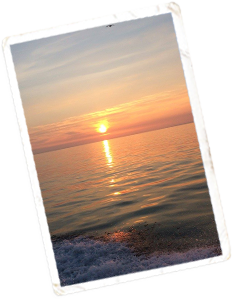 He says Lyme Bay and the Jurassic Coast has so much to offer - he's not wrong there. 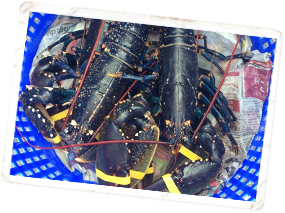 The crew aboard KT-SAM E10 catching some beautiful Lyme Bay lobsters out of Axmouth this week. 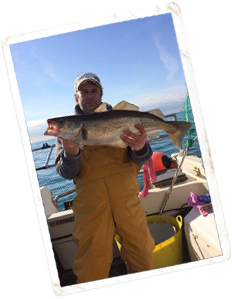 The new era of Lyme Bay fishermen. 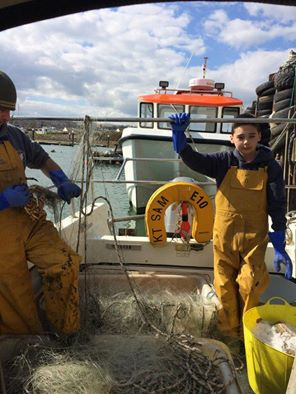 Learning about sustainable fishing from a young age aboard KT SAM E10 from Axmouth Harbour, Devon. 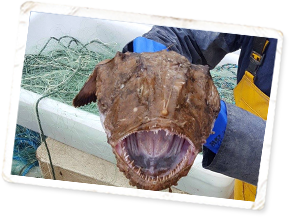 A great weekend was had netting Cod, Plaice, Cuttlefish, Rays, Brill and some lovely Dover Soles. It's not everyday you meet a Royal! 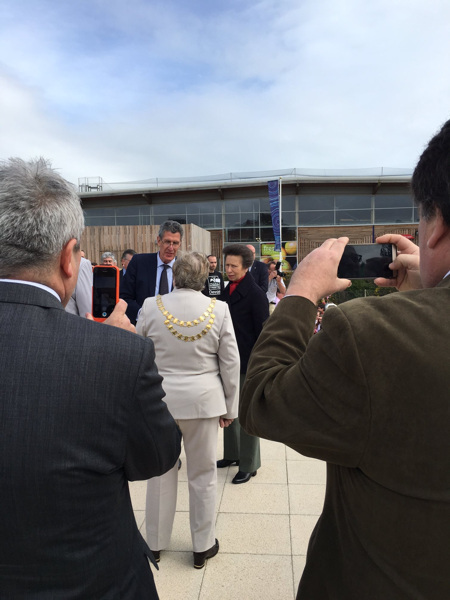 Crowds turned out in force to see HRH The Princess Royal when she visited Seaton Jurassic yesterday. 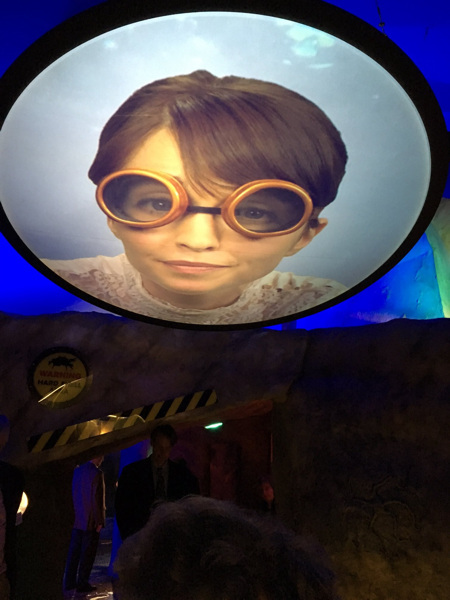 More than 400 flag-waving Seaton Primary School children cheered as she arrived and was given a guided tour of the new £4million visitor attraction. She later unveiled a plaque. 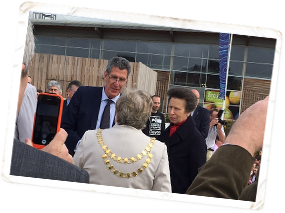 BLUE Marine Foundation, facilitators of the Lyme Bay Fisheries and Conservation Reserve has funded aspects of the Centre which feature the Lyme Bay Reserve project and as a result was invited to meet HRH The Princess Royal. 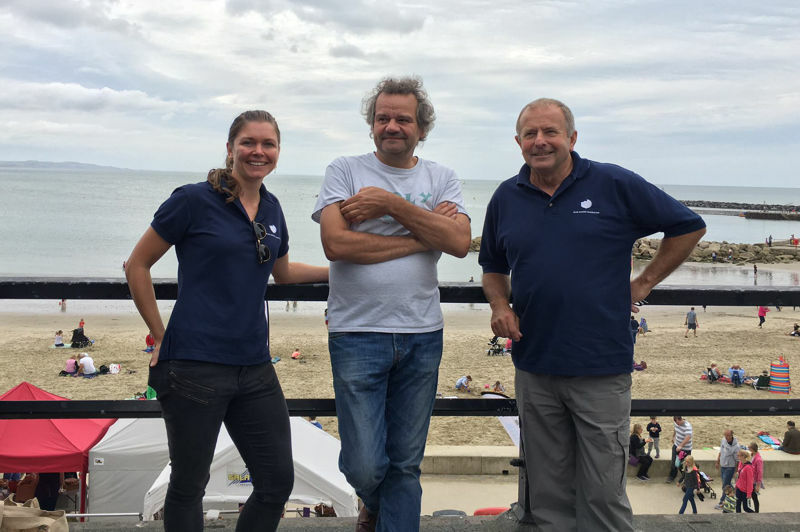 A short exchange of words was had about Blue's involvement with the Centre and the pioneering marine conservation work happening out in Lyme Bay. It was certainly a day to remember for many involved with the Centre. 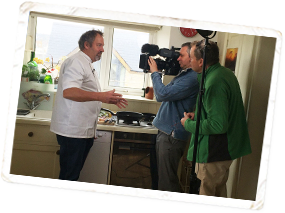 Photos from last weeks BBC Spotlight filming with chef Nigel Bloxham and Adrian Campbell, Environment Correspondent for BBC Spotlight about the Lyme Bay Fisheries and Conservation Reserve being short listed for the European Natura 2000 Award. 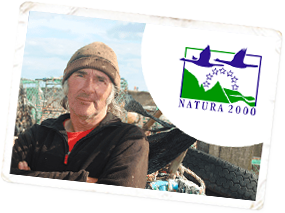 It only takes a minute to vote and every vote will count, so please head over to: http://www.natura2000award-application.eu/finalist/1102 and vote for us! 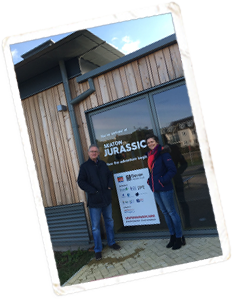 We were invited to attend the Funders & Partners event at the new Seaton Jurassic Centre in Seaton, Devon on Thursday. 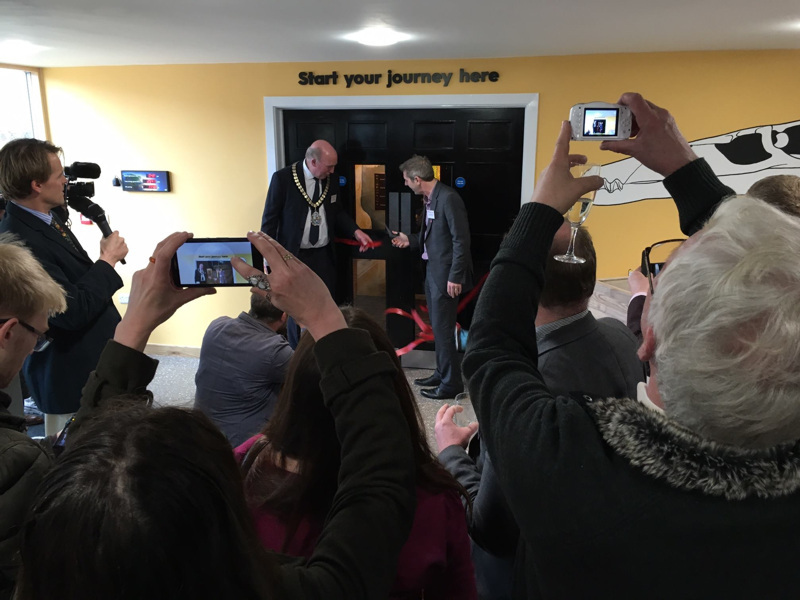 The day started with a speech from Devon Wildlife Trust followed by a talk by Scottish geologist and BBC Presenter Professor Iain Stewart, MBE who then cut the red ribbon. 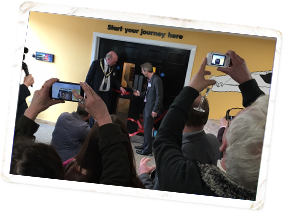 The doors to the Centre were then opened as guided tours took place throughout the day to guests. Not wanting to give too much away and spoil the surprise for you, the Centre is amazing! Attached are a few snippets of what the Centre has in store for you. The craftsmanship, attention to detail and imagination is captivating. 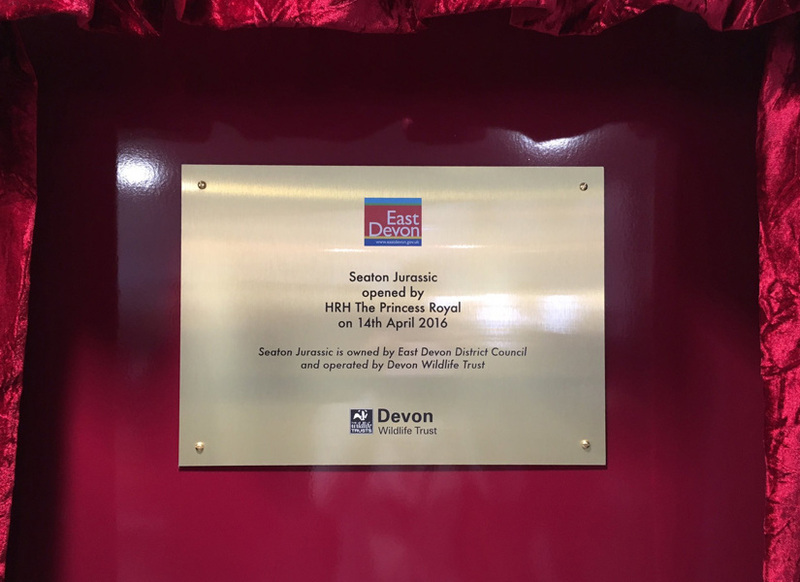 The outside space, which features the Lyme Bay Fisheries and Conservation Reserve project in the form of a harbour set is due to be finished by April 12th when a very important (Royal) comes to officially open the Centre! We are delighted to announce that we have been short-listed for the EU - Natura 2000 Award for our project here in Lyme Bay. It only takes a minute to vote and every vote will count, so please head over to: http://goo.gl/q5ahmV and vote for us. 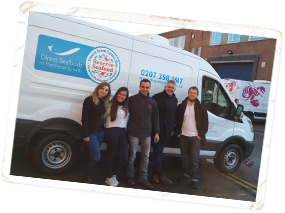 Meet the team behind delivering sustainable, premium quality, provenance-assured seafood from Lyme Bay to top London restaurants. 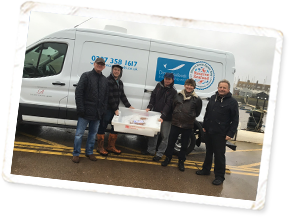 Leading fish merchants Direct Seafoods sends a dedicated delivery van to collect the day’s catch from the ports of Lyme Bay and delivers them direct to London by 10pm the same day. Once they know what has been landed the details are passed on to the marketing team at Direct Seafood to sell to their customers. 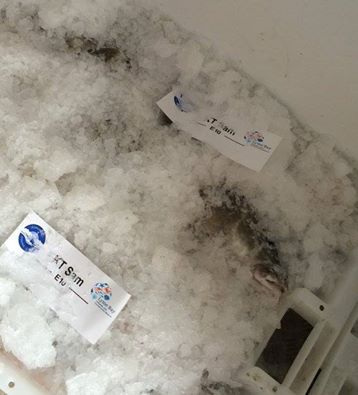 The fish has already been sold before it even gets to London! They then deliver to the restaurants by 8am the following morning. 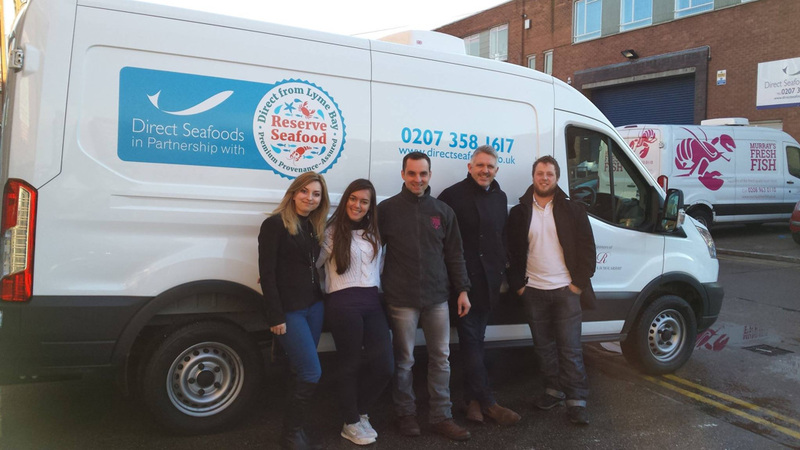 From left to right they are: Alline Andrade and Kamila Ossowicka, (Sales) Alexandru Toma and Jamie Sinclair (Business Development Managers) and Marc Newton (Reserve Seafood Logistics). 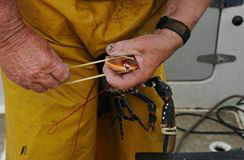 For more information about the Reserve Seafood Scheme head over to: www.lymebayreserve.co.uk/reserve-seafood. 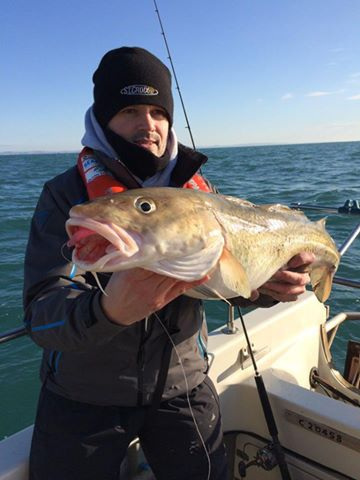 A fine day of fishing was had out in Lyme Bay Reserve over the weekend by Axmouth based E10 KT-Sam crew. 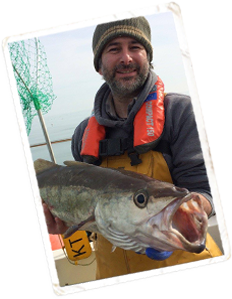 Yet again catching top quality, sustainable, provenance-assured rod & line Pollock. 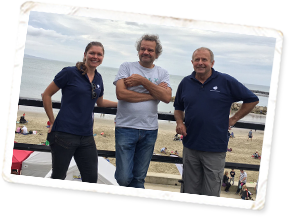 Team BLUE Marine Foundation (facilitators of the Lyme Bay Fisheries and Conservation Reserve) on location in West Bay last week preparing for the new chiller unit. 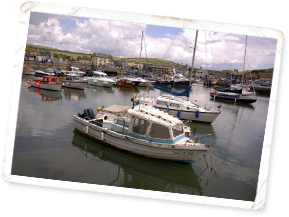 One of the projects aims is to improve existing port facilities with the provision of ice making equipment that will improve the quality, durability and value of the landed catches for fishermen. As fishermen have agreed to a reduction in gear levels in the interests of the environment, it is therefore desirable to help them achieve an optimum price for their catch by way of providing basic ice facilities within their port. 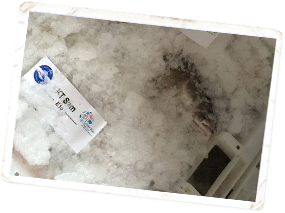 The availability of on-site ice will lead to increased competitiveness and improved quality of the fishermen's catch. 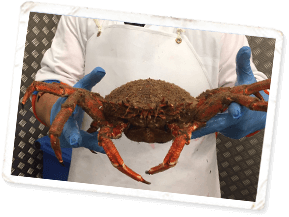 In turn this will lead to increased value on their existing catch from existing markets. 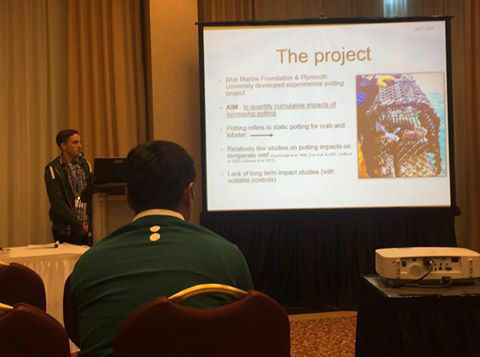 The chiller room is part funded by the BLUE Marine Foundation and the European Fisheries Fund. 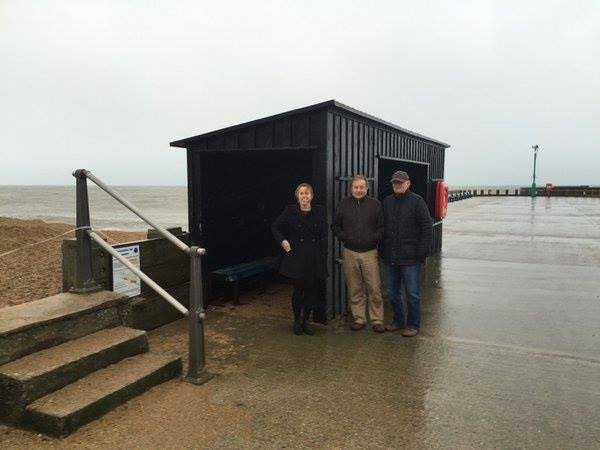 The fishing ports of Beer and Axmouth within Lyme Bay Reserve already have their chiller units installed and are being used to great success. Another club record has fallen! 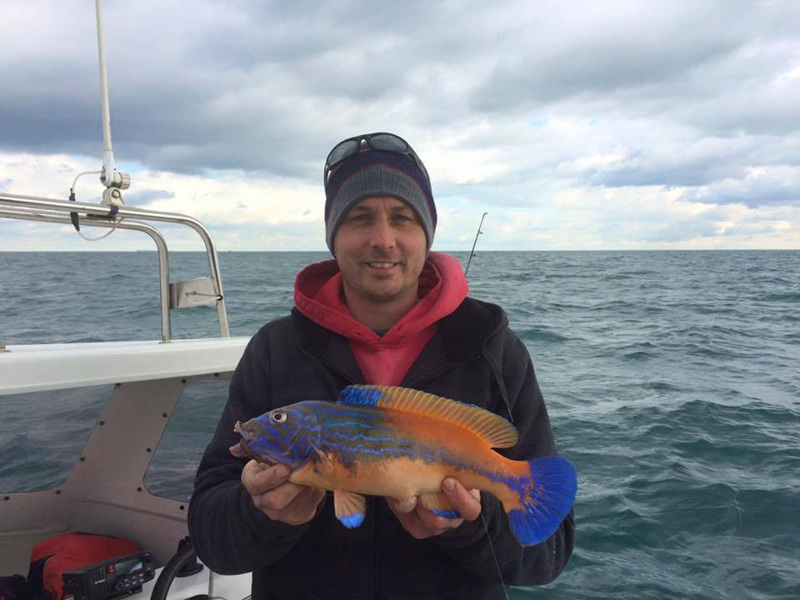 James Trevett from Honiton Sea Angling Club was out on his small boat yesterday in the glorious spring sunshine and during a couple drifts over the rough ground within the Lyme Bay Fisheries and Conservation Reserve pulled up this lovely plump 1lb 12.4oz Cuckoo wrasse. It beats Leon's record by only a quarter of an ounce that was set last year. 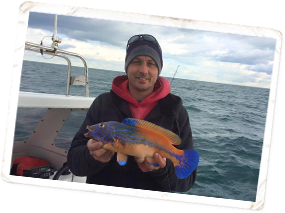 The boys had Pollack up to 15lb 8oz and plenty of Wrasse over 1lb. 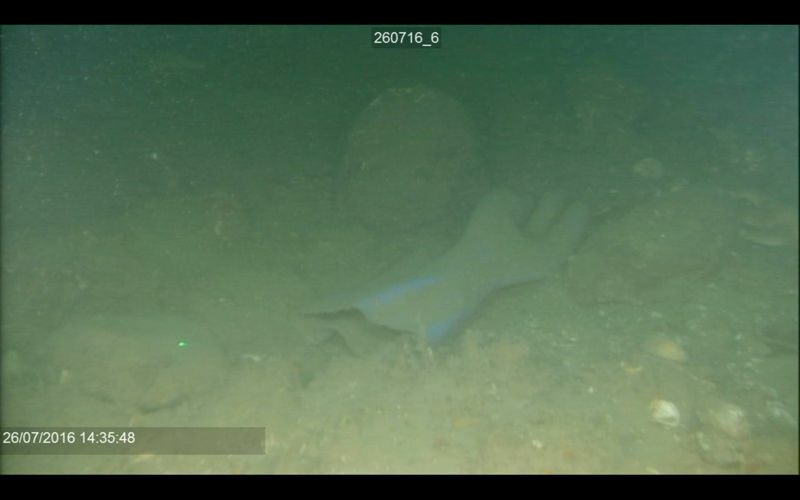 It’s a great sign that the sea bed is recovering well and the stocks are getting stronger. 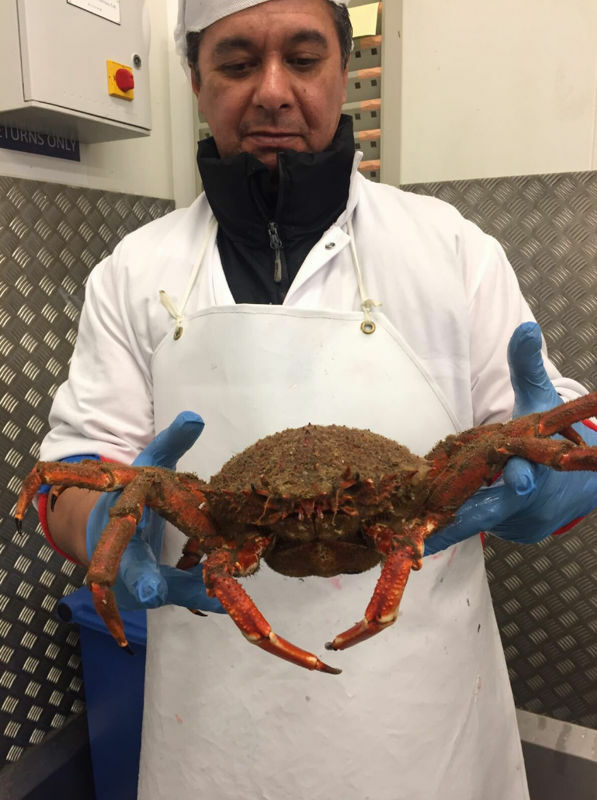 Fishermen selling sustainable catch from Lyme Bay Reserve straight to top London restaurants for 25% more money. Filmed by ITV News Westcountry. Copyright ITV 2016. 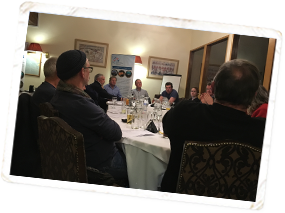 The 30th Consultative Committee Meeting was held yesterday evening in Lyme Regis. 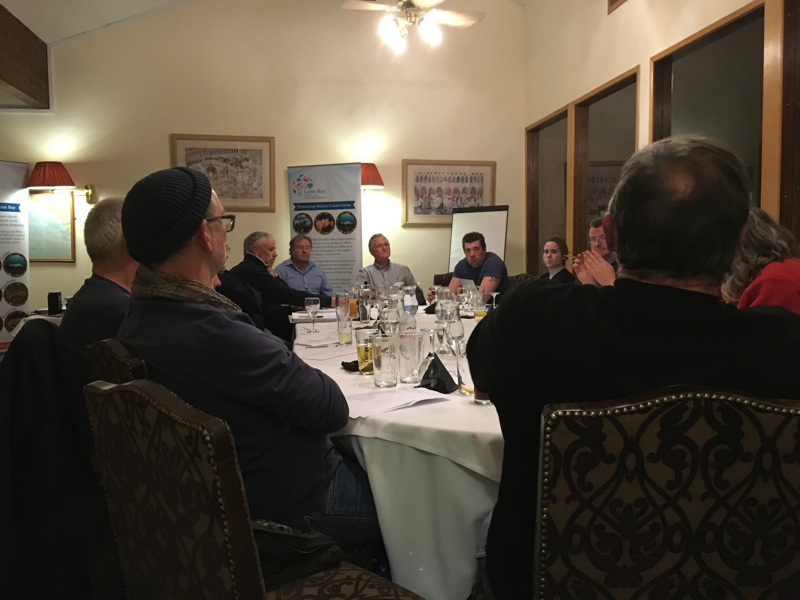 These unique meetings bring together fishermen from the four ports of Lyme Bay, conservationists, marine regulators and scientists in order to establish a sustainable future for Lyme Bay. 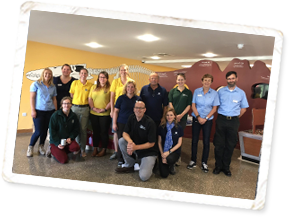 The meeting included: updates on the Scientific Potting Study conducted by Plymouth University Marine Institute, the Fully Documented Fishers Project, the Reserve Seafood Scheme, the Seafish Responsible Fishing Scheme, Ports Infrastructure Project, Seaton Jurassic Centre and much more. The first of these meetings was held on the 25th October 2011 and over the past 5 years shows how a collaborative working partnership between all parties can work and continues to work. 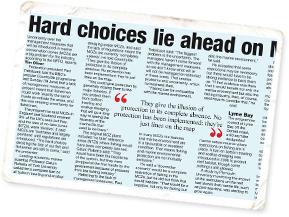 Credit to all involved for the future of Lyme Bay. 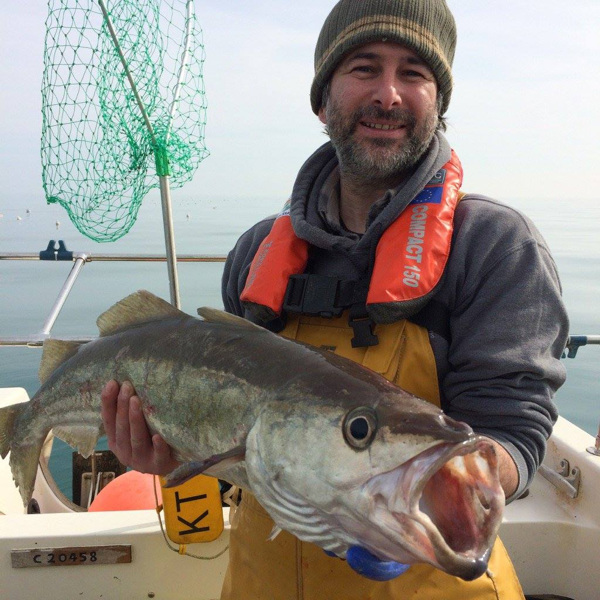 Lots of quality fishing being caught in Lyme Bay Reserve at the moment with this impressive Pollack caught on KT-Sam E10 yesterday and a huge 10lb Cod. 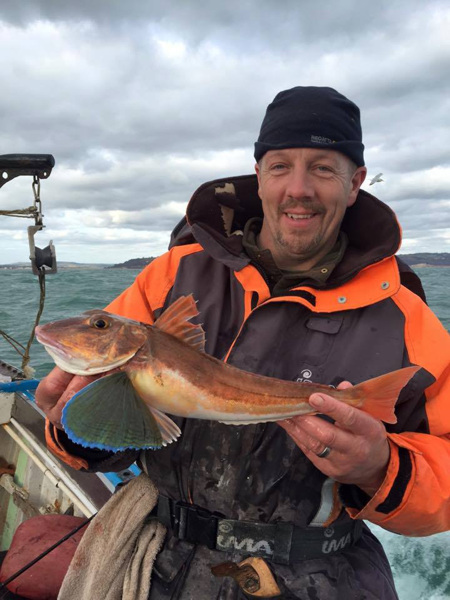 Honiton Sea Angling Club has noticed huge improvements in the varieties of fish and sizes since the Reserve has been established. 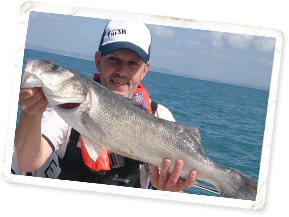 Catch reports from the Club have also improved not just from the boat, but also from the shore in and around the area with good numbers being landed throughout the season with some large fish amongst then too. 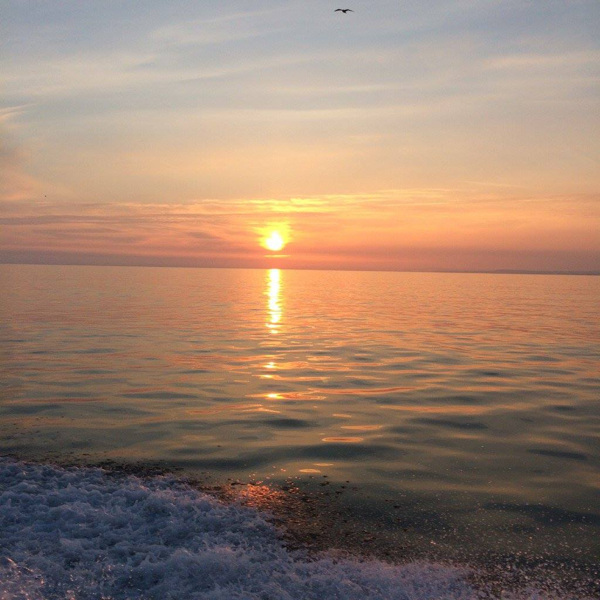 Photos courtesy of Nigel from his boat KT-Sam E10, Axmouth. 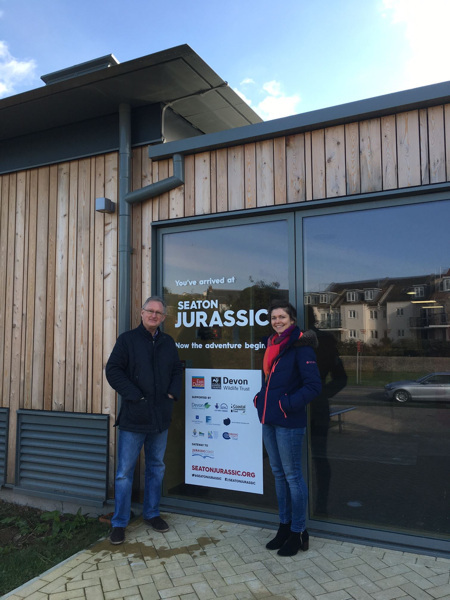 It's all systems go at Seaton Jurassic! 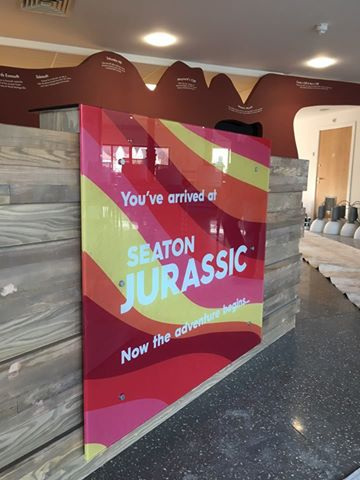 We headed to Seaton Jurassic this morning to see how the Centre is coming along as the opening day approaches. 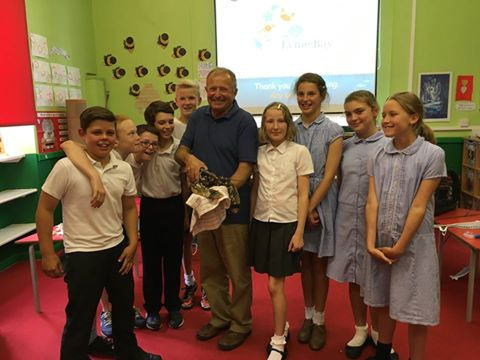 The Lyme Bay Fisheries and Conservation Reserve (facilitated by the BLUE Marine Foundation) is lucky enough to be involved and feature in Seaton Jurassic - a great opportunity to communicate to the wider public about the pioneering marine conservation work happening right out on the doorstep in Lyme Bay. 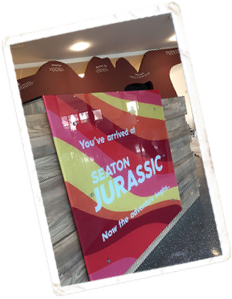 Understandably, Seaton Jurassic are keen to keep it under wraps for the grand opening, however we were allowed to take some pictures of the foyer/cafe area and signage outside. Exciting times ahead indeed. 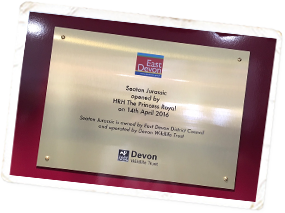 Keep your eyes peeled here as we report on all the latest developments from Seaton Jurassic in the run up to the opening day. 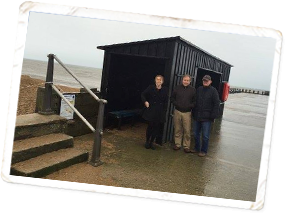 Pictured here is BLUE Marine Foundation UK Projects Director and Chairman of the Lyme Bay Fisheries and Conservation Reserve, Tim Glover and Rowena Taylor, Reserve Communications Coordinator. 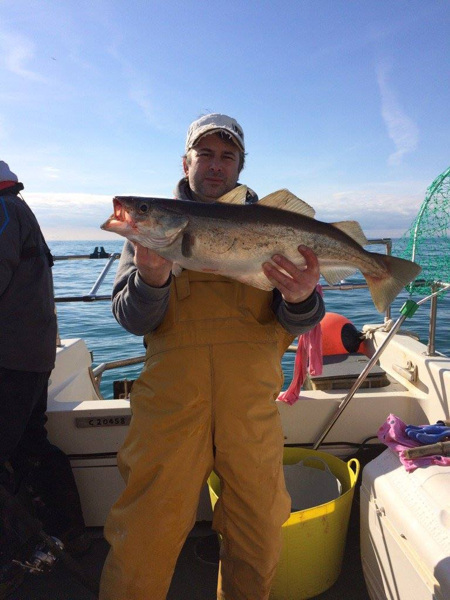 A successful day of fishing for the Honiton Sea Angling Club yesterday as they headed out from Beer, Devon. A good catch of nice sized whiting and pout was waiting for them. Also caught were a smoothound, dab and even a chunky tub gurnard. The sea wasn't flat for long and it soon blow up from the south whipping up some good-sized swells. Photos thanks to James Trevett at Honiton Sea Angling Club. 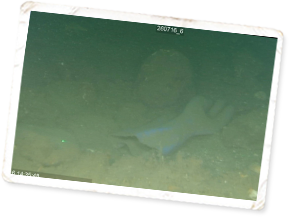 A very busy Lyme Bay seabed in this video with lots of common sea stars (Asterias rubens) visible, sometimes a little too visible! Not particularly helpful when trying to analyse the video, however some great close-ups none the less. See how sea stars move using numerous suckers, called tube feet, as legs. Although the video has been sped up this is an effective mechanism at getting around. 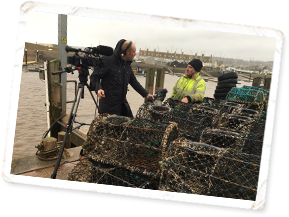 A wet and windy Axmouth Harbour greeted ITV Westcounty News yesterday as they filmed a piece on the launch of the Lyme Bay Reserve Seafood brand. Local press also turned out to report on this pionerring initiative. The Reserve Seafood brand puts sustainability on the menu as it launches ‘boat to plate’ provenance scheme. 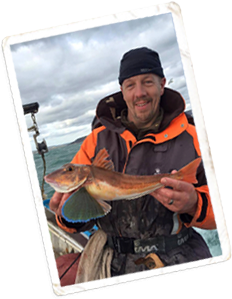 The new scheme is a collaboration between the fishermen of the four Lyme Bay ports and the BLUE Marine Foundation, who has installed chiller rooms, ice-makers and freezer units in return for fishermen signing up to a strict conservation code and electronic monitoring. It is the culmination of a three-year initiative to regenerate a damaged 90 square miles of reef on the Dorset/Devon coast. 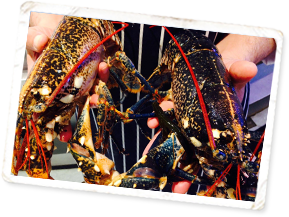 Through the scheme, leading fish merchants, Direct Seafoods collect the day’s catch and supply to London’s top restaurants. 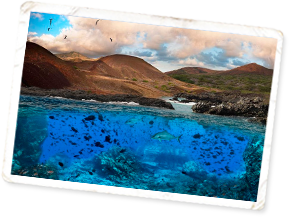 A marine reserve almost the size of the United Kingdom? 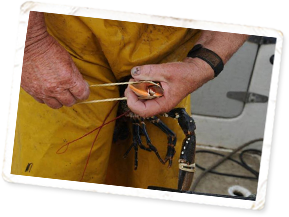 Brilliant work from the BLUE Marine Foundation, facilitators of the Lyme Bay Fisheries and Conservation Reserve. 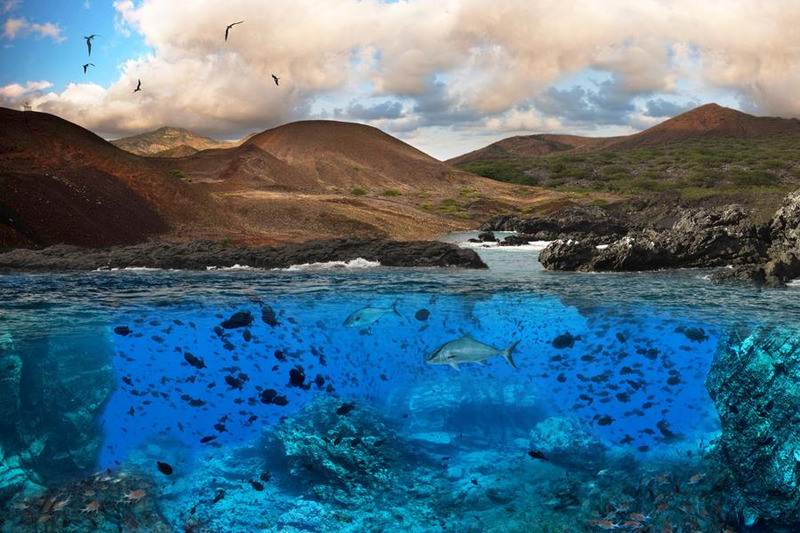 BLUE is delighted to announce the creation of a marine reserve almost the size of the United Kingdom around Ascension Island in the Atlantic. 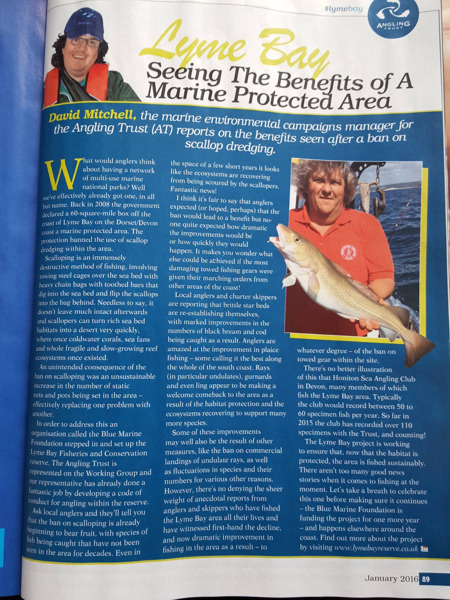 Fantastic full-page report in Total Sea Fishing Magazine written by the Angling Trust about the success of the Lyme Bay Reserve. The publication is out now, so snap up your copy today or head over to www.totalseamagazine.com for further details.